A U.S. Senate committee votes tomorrow on the nomination of west Michigan billionaire Betsy DeVos as the next U.S. Secretary of Education. Michigan groups for and against the controversial nomination were busy over the weekend lobbying before the vote. Gary Naeyaert is the executive director of the Great Lakes Education Project, which was founded by Betsy DeVos. He says Betsy DeVos is an excellent choice to guide America's education system. That irks teachers’ unions, who claim DeVos has worked against traditional public schools. Russ Bellant is with Save Michigan’s Public Schools. He says DeVos is the wrong choice to lead an agency that works with traditional public schools. “Even as a parent … (DeVos is) not a person who’s ever been known to go inside a public school and spend any time with the public education community and show any sign of concern about their welfare or success,” claims Bellant. Democrats on the Senate Committee on Health, Education, Labor and Pensions are all planning to vote against DeVos’ nomination. But unless they can convince some Republicans to join them, either in the committee or in the full senate, DeVos will be confirmed. Adding to the pressure on Republicans, DeVos has been a major GOP campaign contributor over the years. 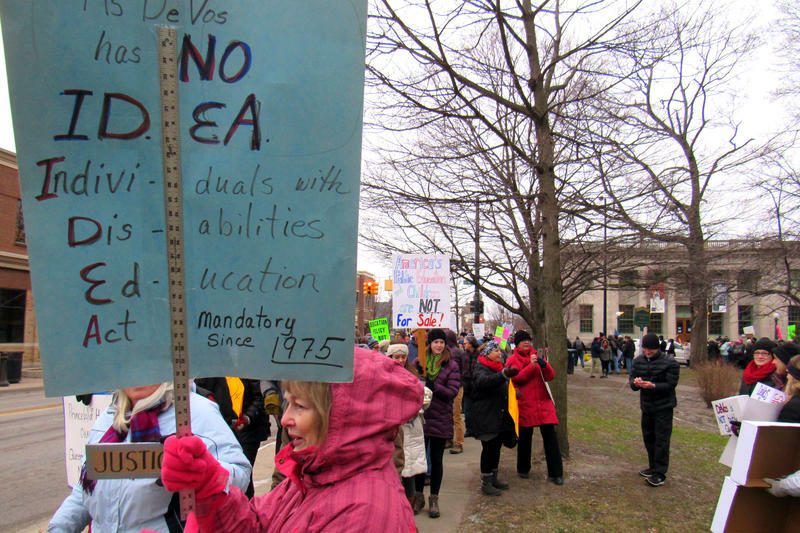 About a thousand people marched in Betsy DeVos’ hometown Saturday afternoon, to protest her nomination as U.S. Education Secretary. “I was expecting maybe 500 people,” Cadence Morton of Caledonia says of Saturday’s march in Holland. She helped publicize the rally, which began as a private facebook event among friends. For more than an hour protestors with handmade signs wrapped around the perimeter of Centennial Park; about the size of a football field in downtown Holland. “That is just incredible," Morton says. "I’m floored by that." 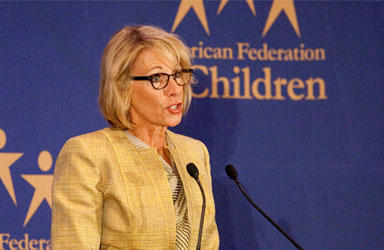 President-elect Donald Trump’s choice to head the U.S Department of Education went before the Senate education committee yesterday for her confirmation hearing. Senators asked many questions of Betsy DeVos – some about her Michigan family’s donations of millions of dollars to Republican candidates, others about whether she would mandate that public schools become charter or private schools. 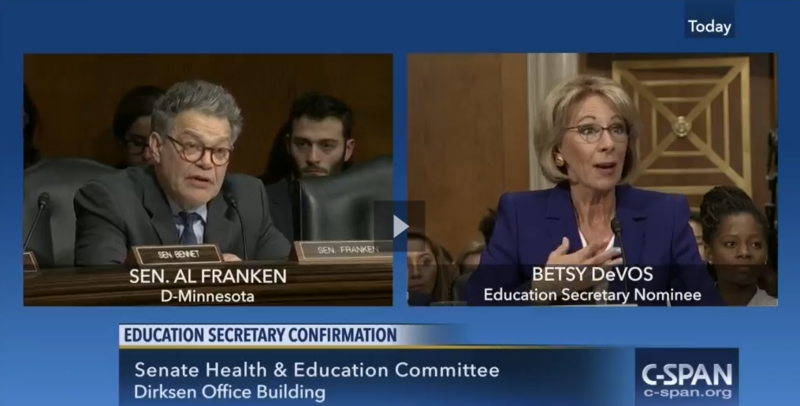 Yet, it was an exchange between Minnesota Senator Al Franken and DeVos that caught our attention.